Bibili lamang si YouScooper Sedricke Lapuz ng aklat nang makita niyang nagbabasa sa loob ng isang Booksale sa Maynila ang isang batang pulubi. Kitang-kita sa mukha ng bata ang saya habang nagbabasa nang malakas at tumitingin sa mga larawan. Nilapitan ni Sedricke ang bata at tinanong kung marunong ba siyang magbasa. "Kaunti lamang po," sagot ng bata. Hindi akalain ni Sedricke na may mga batang salat man sa yaman, nais pa ring matuto. Matapos nilang mag-usap, naisip niyang bilhin ang alinmang librong magustuhan ng bata. Hiling niya, nawa'y matulungan ang bata. 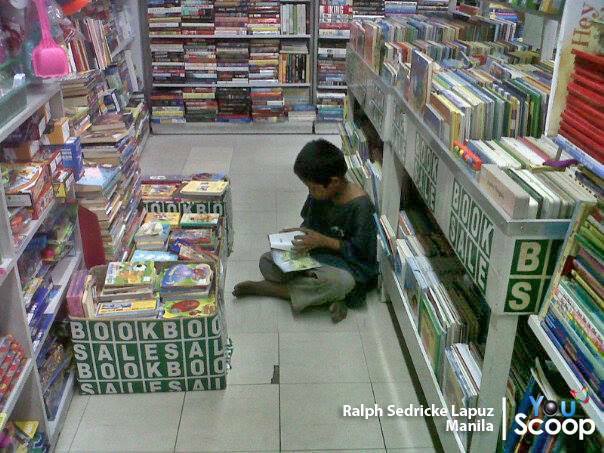 Ralph Sedricke Lapuz saw a kid beggar in Booksale (a famous bargain and second hand bookstore chain in the Philippines). Sedricke noticed the kid's happiness. He was amused with the pictures, while loudly reading the book. Sedricke approached the kid and asked whether he knows how to read. The kid told him that he can read to a limited extent. Sedricke was amazed because there are kids who still hunger for knowledge despite poverty. After their conversation, Sedricke gifted the kid with any book he wanted. Sedricke hopes that the kid will receive the right assistance someday. Hats off to my favorite Booksale for not depriving this kid of the rare opportunity. This makes me love more Booksale. Like Sedricke, my heart goes to the kid who has the purest intention of finding happiness in reading. Hopefully, a kind heart will give the kid a chance. Very touching. Books shouldn't be just for the privileged few. They should be made readily available for everybody! I always donate my old books! Well this story certainly does my heart good....thanks for posting it! Your blog makeover is looking very pretty, my friend. LOVE the color scheme! Only three more days left in the school year....YAY!! !